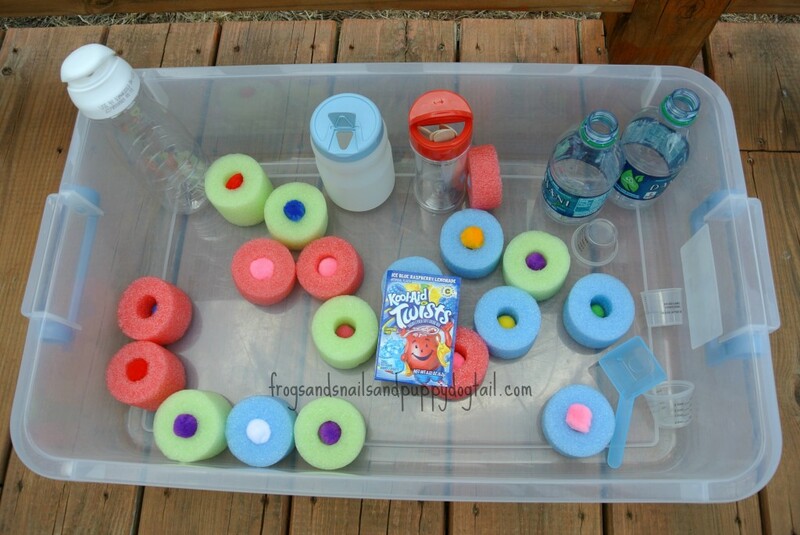 Pool noodles, this weeks theme in our Play The Summer Away: Water Bin Play For Kids Series with Sugar Aunts. We have been bringing you a new water bin idea each Monday for the month of July. If you have missed our past ones be sure to stop by the home page here to see all of the ideas in one spot. 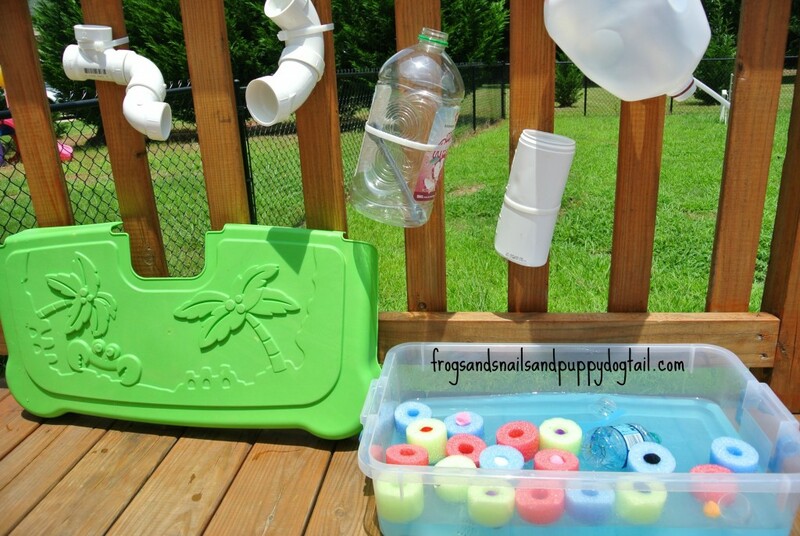 We made pool noodle blocks a month ago and decided to use them in a water bin. It is so easy to make. Just take cheap dollar store pool noodles and cut them up with a knife. This is for parents to do. Now you have a new toy for you and the kids to play with. 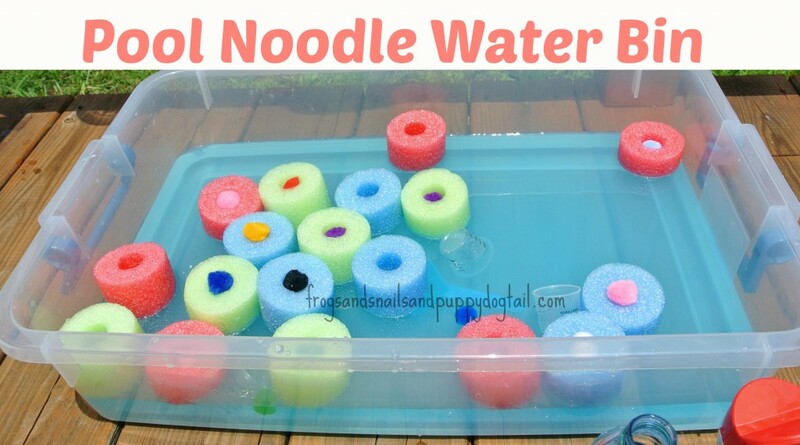 I placed the pool noodles with pom poms in them in a water bin( an under the bed storage container). I added empty containers and little measuring cups. I filled up a bucket with water and brought it outside. I added the kool aid to the bucket and then added it to the water bin. I set up this invitation to play next to our water wall. Just a little extra fun to be had. My toddler was right under me through most of the set up. It took me about 5 minutes to get this together. Once everything was ready my preschooler was ready to come out and play. We took advantage of baby brother taking a nap to play outside. We have had lots of rain on and off for a few weeks now, so it was nice to get outside. 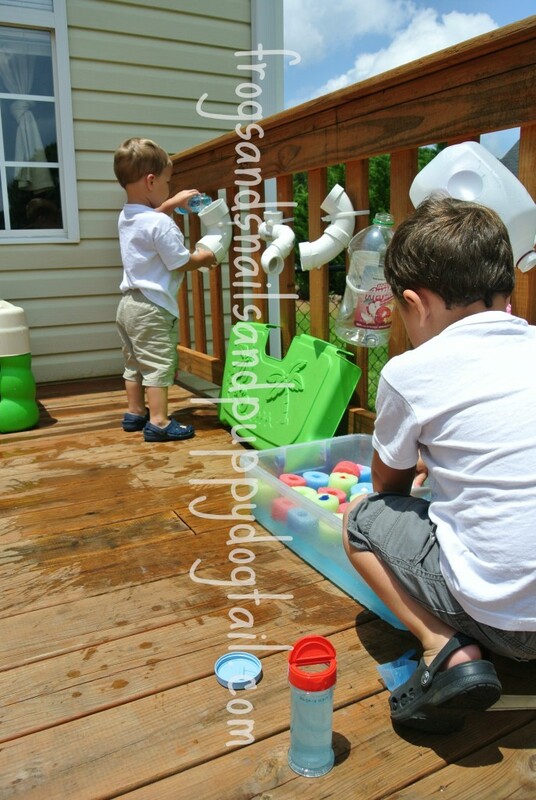 They scooped and poured the water, which is great for gross motor skills and hand eye coordination. We went over colors (as always) of what we had in our bin. We talked about the shape of the pool noodle, circle. They did a little problem solving on how to get the water over to the water wall and how to get the lid off the containers. 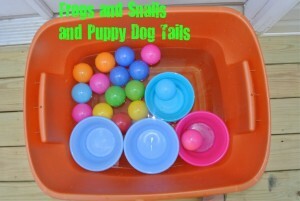 Taking the lids on and off was also good for their little hand muscles. We did a little observing of what sank and what floated in the water bin. This is a favorite of ours right now. We got to explore our senses through sight, sound, smell, and touch. 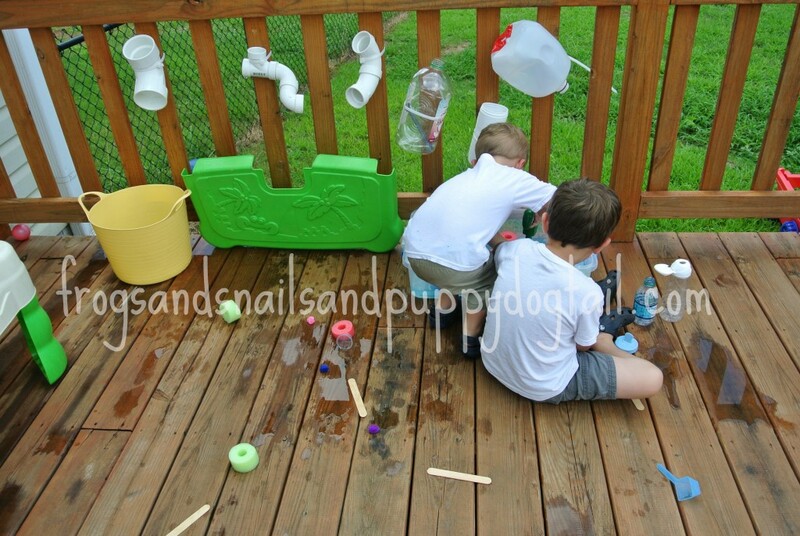 I guess they could have tasted the kool aid water but… We are always working on teamwork and sharing over here, so having one water bin to play in worked on those areas for us. Lots of learning going on and to them it was all play! 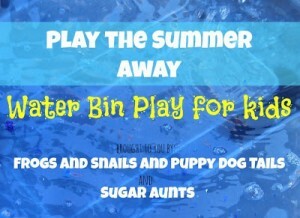 We had a good time in our pool noodle water bin and I can’t wait to stop over to Sugar Aunts To see what fun they had. 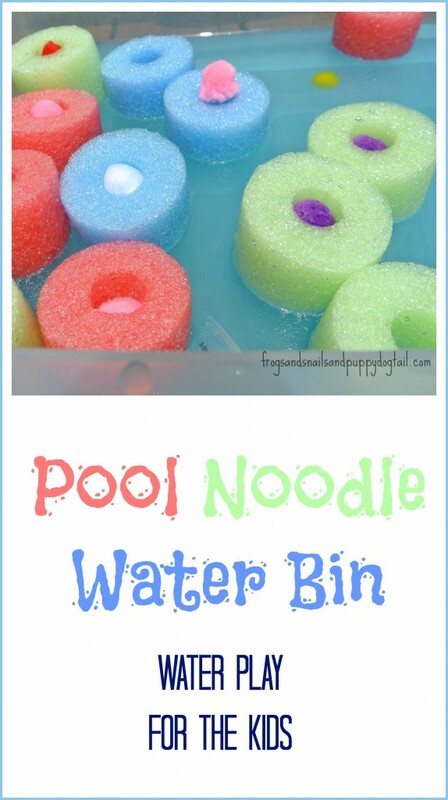 Come on over with me to see what they did in this week’s Pool Noodle Water Bin HERE. Be sure to check back next week to see our last themed water bin with Sugar Aunts. 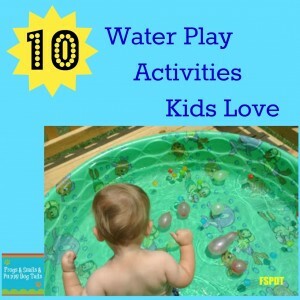 But don’t worry, the kids and I love water play over here so there will be more to come. This is so much fun! I love your water wall, what a great way to add a dimension to this water bin! Adding the poms was a great idea. I bet the water smelled pretty good, too! Can’t wait to see what you have in store for next week! Wish we were having your warm sunny weather here! Love the noodles and am featuring on my Kid’s Co-Op post this week !